Fueled by Clouds & Coffee: #Oneweek100people2018 Begins! Marc Holmes and Liz Steel have once again nudged sketchers everywhere to take part in their annual initiative, One Week 100 People. From March 5 – 9, all you have to do is make sketches of 100 people – from life, from photos, even from your mirror – and share them online with the hashtag #oneweek100people2018. When I took part in the challenge last year, it was, indeed, challenging, but also a lot of fun! “The goal is practice. Not perfection,” says Marc, and with that in mind, I started getting faster and faster as the week went on. My personal goal was to make as few marks as possible while still evoking an individual – through expression, gesture or posture – and not a generic symbol. I’m going to stick to the same goal again this year. 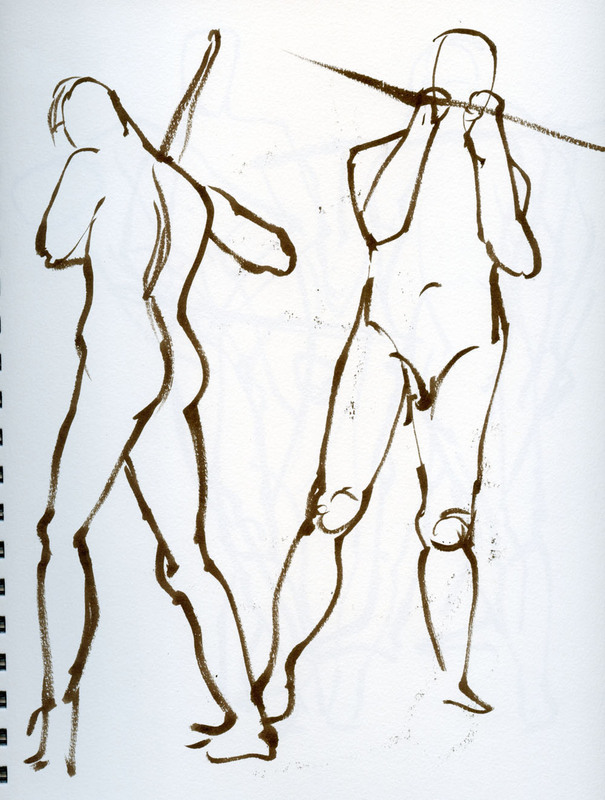 These sketches are from last Thursday at Gage life drawing, where I made more than 30 drawings during the three-hour session – it’s easy to do when a model is standing right in front of me. 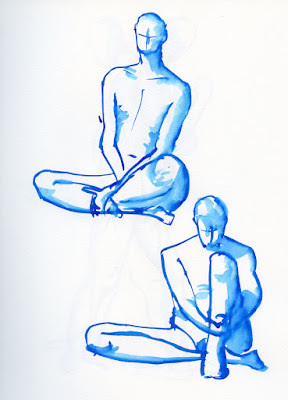 You can bet I’m going to life drawing again this week! 😉 But I’ll also be going out in public to sketch people in the usual way. I may not post all 100 sketches here, but you can check my progress on Instagram. 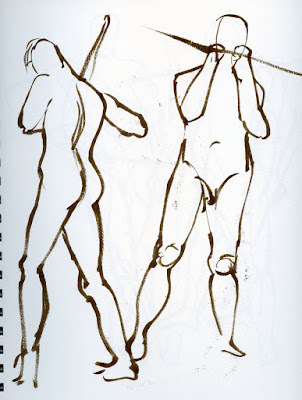 Nice sketches of the life models! I did start my 100 people and completed 17 today. Yay!! Yay! Good for you, Joan! I'm trying for 20 per day, and I just hit 20! I started from photos of people walking and was not enjoying it (and I dislike drawing people anyway), but then my friend The Other Tina suggested action photos, and starting with simple silhouettes. I tried dancers, and that triggered something--did the silhouettes, then got looser and freer and just enjoyed it immensely. Only did 12 yesterday so need to catch up! Great -- glad you found something that works for you! Yesterday I started with portraits on the bus, but what I really enjoyed was catching passers-by or bus waiters. They are gone in a matter of seconds or minutes, so I get a lot done!